First off, I loved the concept of this book. The idea of integrating a murder mystery into a circus style setting and having the victims be illusions? I mean that is some creative stuff and I have to give Amanda Foody props for that. I’ve read quite a few circus set YA books, especially in the last few years and I have to say that this one definitely stands out as unique amongst them, not only in the way the book’s plot unfolds, but the characters, the circus itself, the magic system, the illusions, I definitely won’t be forgetting Gomorrah anytime soon! Whilst I did love the magic system, and that people could have all types of magic, whether it be charms, mind reading, fortune telling, creating illusions like Sorina, I did feel like it could have been explained better and this comes back to a larger problem with this book; the world building. I think Amanda Foody created great bones for this world, Gomorrah was a very cool setting, the magic was interesting, the illusions were great, I liked the obvious biblical influences but I think she could have gone into a lot more depth. For me, 400 pages actually wasn’t quite long enough, I could have done with more explanations on how these people came to have jynx work, exactly why the Up Mountains are so prejudiced against those with it, more of an explanation of how exactly Sorina could see etc. The bones are there, it just needed to be expanded on. Also all of the politics were a bit confusing, and I think that had the book been a bit longer, the politics of the Up Mountain/Down Mountain divide could have been explained better. I think Amanda Foody crammed a lot of stuff into a standalone and didn’t fully develop it, so either the book needed to be longer or there needed to be more books! I went back and forth on the main character Sorina. I didn’t love how easily she was manipulated and how indecisive she could be, but I did love how protective she was of her family and how determined she was to find out what happened to them and I think she was a lot braver than she actually gave herself credit for. Sure, there were times that I wanted to shake her for being so stupid, but sixteen year old girls aren’t perfect, they can be indecisive and naive and I appreciated that this book showed that. Plus, I absolutely loved her illusion magic and actually wished we could have seen more of it, as I feel like the book (and Sorina herself) barely scratched the surface of what she could do. I really needed there to be a map! So many different places are mentioned, within Gomorrah and the rest of the world, and I couldn’t really place them because I didn’t have a visual. It would have been nice, and definitely would have added to the wonderful aesthetics of the book, had I had a map of both Gomorrah and the Up and Down Mountains to refer to throughout the book. I liked all of the diverse sexuality representation in this, it was weaved in so naturally and matter of factly and I feel like that’s what we want to get to? A place where characters can be gay and it’s an important part of their character, but it’s not the only thing about them. Sorina is bisexual, one of her illusions, Nicoleta is a lesbian and Sorina’s love interest Luca is on the asexual spectrum. I will say that I felt like Luca’s sexuality was a little confused and I wasn’t sure exactly whether he was asexual or demisexual, it seemed like from what Luca said, the author was going for demisexual, but it did feel a bit muddled to me-however, I do not identify as on the asexual spectrum, so I would refer to actual asexual reviewers for more clarification on the asexual rep. Sorina also had quite frequent bouts of anxiety and panic attacks and I thought that was handled well. The illusions did feel a little bit flat to me, I cared about them because Sorina cared about them, but it felt as if they were designed to have one characteristic and one characteristic only. Still, I was just as determined as Sorina to find out what happened to her family. I also felt like they were all introduced a bit too fast at the beginning and started getting killed off quite quickly so I didn’t feel like I really got a chance to get to know some of them. The plot was a little bit slow to develop, I mean on the one hand, this worked quite well as the mystery was given time to unfurl but on the other hand, there did come a point when I was getting a bit ancy to find out what happened. I will say though that I never found myself feeling bored, even when the plot was feeling a bit slow, so that was definitely a good thing. The chapters were also a little lengthy, which is never great for me, I prefer things short and sweet! I loved the addition of the sketches of Sorina’s illusions and the killer’s notes on them, I thought they added to the creepy vibe of the book. I really loved Sorina’s love interest Luca, I loved his slightly morbid sense of humour, how he was smart and slightly cocky and how I couldn’t decide from one page to the next whether I wanted to hug him or slap him! He and Sorina had great banter and I loved how their romance developed quite slowly throughout the book, I mean Sorina has a crush on him almost straight away, but it takes a while for anything to really develop. The writing was very visual and atmospheric, which I appreciated, because as a reader, I’m not great at picturing things for myself, I’m much more auditory, I can hear conversations between characters in my head but picturing scenes? Nah mate! Nevertheless, I appreciate it when authors paint a really vivid picture with their words because even if I can’t actually see it in my head, I can feel it. I felt like the end was a bit anticlimactic and had it ended a couple of chapters earlier, the end might have had more impact, much as I liked seeing how things had turned out for everyone, I felt like the end of Chapter 25 would have had more impact as an ending. 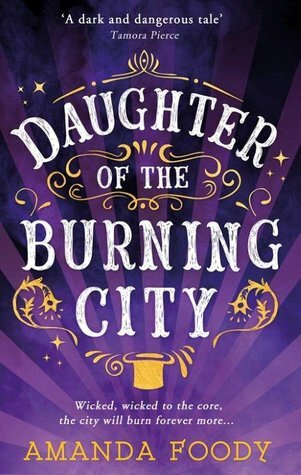 Overall, this was a really creative, unique, dark fantasy murder mystery and whilst there were certain kinks that needed to be worked out with the world building and characters, it showed a lot of promise for a debut author. This works well enough as a standalone, but I would love to see a sequel to it, because I feel like there’s so much more of Gomorrah to be explored! BECHDEL TEST: Pass-I had to search pretty hard for it, but there is a conversation between Hawk and Sorina that is not about men and passes the test-this book definitely could have done better on it though. My next review will be of the latest Trials of Apollo book, The Burning Maze by Rick Riordan.